New research could be the key to understanding the origin of life. Modern science has advanced significantly over the last couple of decades. We’ve managed to answer several of the world’s most long-standing questions, but some answers have continued to elude today’s scientists, including how life first emerged from the Earth’s primordial soup. However, a collaboration of physicists and biologists in Germany may have just found an explanation to how living cells first evolved. In 1924, Russian biochemist Alexander Oparin proposed the idea that the first living cells could have evolved from liquid droplet protocells. He believed these protocells could have acted as naturally forming, membrane-free containers that concentrated chemicals and fostered reactions. In their hunt for the origin of life, a team of scientists from the Max Planck Institute for the Physics of Complex Systems and the Max Planck Institute of Molecular Cell Biology and Genetics, both in Dresden, drew from Oparin’s theory by studying the physics of “chemically active” droplets (droplets that cycle molecules from the fluid in which they are surrounded). Unlike a “passive” type of droplet, like oil in water, which will just continue to grow as more oil is added to the mix, the researchers realized that chemically active droplets grow to a set size and then divide on their own accord. This behavior mimics the division of living cells and could therefore be the link between the nonliving primordial liquid soup from which life sprung and the living cells that eventually evolved to create all life on Earth. “It makes it more plausible that there could have been spontaneous emergence of life from nonliving soup,” said Frank Jülicher, co-author of the study that appeared in the journal Nature Physics in December 2016. It’s an explanation of “how cells made daughters,” said lead researcher David Zwicker. “This is, of course, key if you want to think about evolution. Some have speculated that these protocellular droplets might still be inside our system “like flies in life’s evolving amber.” To explore that theory, the team studied the physics of centrosomes, which are organelles active in animal cell division that seem to behave like droplets. Zwicker modeled an “out-of-equilibrium” centrosome system that was chemically active and cycling constituent proteins continuously in and out of the surrounding liquid cytoplasm. The proteins behave as either soluble (state A) or insoluble (state B). An energy source can trigger a state reversal, causing the protein in state A to transform into state B by overcoming a chemical barrier. As long as there was an energy source, this chemical reaction could happen. “In the context of early Earth, sunlight would be the driving force,” Jülicher said. Odarin famously believed that lighting strikes or geothermal activity on early Earth could’ve triggered these chemical reactions from the liquid protocells. 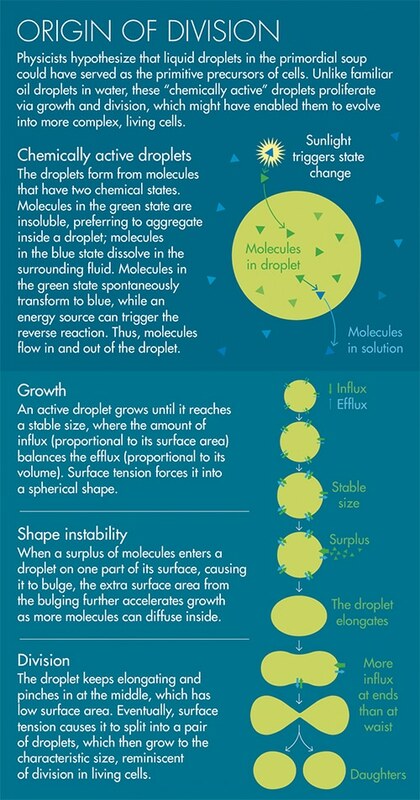 This constant chemical influx and efflux would only counterbalance itself, according to Zwicker, when a certain volume was reached by the active droplet, which would then stop growing. Typically, the droplets could grow to about tens or hundreds of microns, according to Zwicker’s simulations. That’s about the same scale as cells. The next step is to identify when these protocells developed the ability to transfer genetic information. Jülicher and his colleagues believe that somewhere along the way, the cells developed membranes, perhaps from the crusts they naturally develop out of lipids that prefer to remain at the intersection of the droplet and outside liquid. As a kind of protection for what’s within the cells, genes could’ve begun coding for these membranes. But knowing anything for sure still depends on more experiments. So, if the very complex life on Earth could have begun from something as seemingly inconspicuous as liquid droplets, perhaps the same could be said of possible extraterrestrial life? In any case, this research could help us understand how life as we know it started from the simplest material and how the chemical processes that made our lives possible emerged from these. The energy and time it took for a protocell to develop into a living cell, and the living cells into more complex parts, until finally developing into an even more complex organism is baffling. The process itself took billions of years to happen, so it’s not surprising we need some significant time to fully understand it.